Attacks on villages in Darfur allegedly by a paramilitary unit are an "ugly blemish" on efforts to find a peaceful solution for the restive Sudanese region, Darfur's top peacekeeper says. "The ongoing attacks on civilian villages and camps for internally displaced people, alleged to be carried out by the Rapid Support Forces, are a matter of concern and are an ugly blemish on our efforts to dialogue," said Mohamed Ibn Chambas, who heads the African Union-United Nations Mission in Darfur (UNAMID). He said this violence is the main cause of the displacement of some 200,000 civilians in Darfur in the past month alone. "Regardless of who is ultimately responsible for this violence, it must now stop," he told a forum of Zaghawa tribal leaders in Chad which aimed to get armed groups to join a peace process. UNAMID released his comments in a press release late Wednesday. Magdi El Gizouli, a fellow at the Rift Valley Institute, has described the Rapid Support Forces (RSF) as "almost like a mercenary army" of 6,000 men. The RSF returned to Darfur earlier this year after supporting government operations against rebels in South Kordofan state. 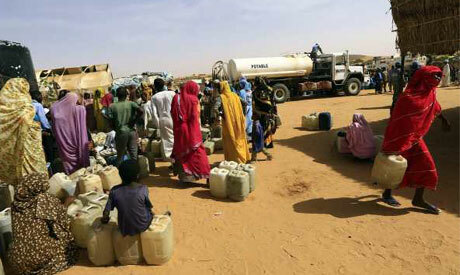 Since then, a series of attacks occurred in North and South Darfur. Chambas said anti-government rebels, who also attacked some areas recently, must also halt their aggression. "They have proven incapable of defeating Sudan Armed Forces and only increase the suffering of the people of Darfur," he said. Major rebel groups have not joined a 2011 peace deal which Khartoum signed in Qatar with an alliance of rebel splinter groups. The dynamics of Darfur's conflict have changed since the insurgents began their uprising in 2003. Analysts say the government can no longer control its former Arab tribal allies, whom it armed against the rebels. A senior UN official said on Wednesday that despite a soaring number of people needing help after recent violence, aid workers in many parts of Darfur face increasing government restrictions on their movement.